Vanessa Hudgens’ choice of the short straight cut for the summery look is a great way to show off a beautiful tan and healthy luscious black hair. Cool and breezy, this short straight cut requires the minimal of fuss to create a stunning effect for day or night dos. A small amount of hair wax will help to hold the style in place without any fuss. The style helps to create a well-balanced look to frame most face shapes, making it a popular choice for the easy summer styles. It can easily be dressed up to show volume or flattened down to a neat and tidy finish. 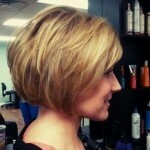 This short straight haircut is great for oval, round, square face shapes.